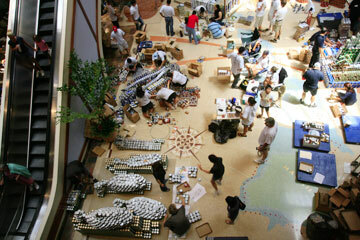 Designers and their cans covered the floor of Pearlridge Uptown Saturday. Six hours and several thousand cans later, the volunteers who participated in "Canstruction" at Pearlridge Center Saturday could finally sit back and admire their handiwork. Vote for the People's Choice Award: Bring a canned food item and place it in the cart near your favorite sculpture. Each can counts as one vote, and you can vote any number of times. Guessing game: Guess how many cans were used in all the sculptures combined; the winner will receive a trip for four to Disneyland. 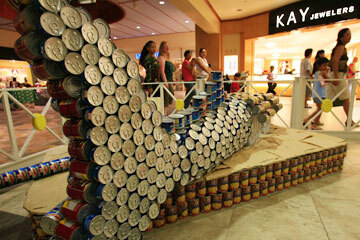 Best Meal: "Hunger Bugs Me," KFC Airport Inc.
"Canstruction" was a call for Hawaii's architects, designers, engineers and builders to come up with creative concepts for sculptures made entirely of canned goods. No black-hearted competing here, but high-fives all around for such creations as a lovely hula girl, a slipper squashing a cockroach, fish sculptures (six), exploding volcanoes (two), a pig made of Vienna sausage cans and, yes, giant Spam cans. And when a few projects wavered and fell, other teams cringed. 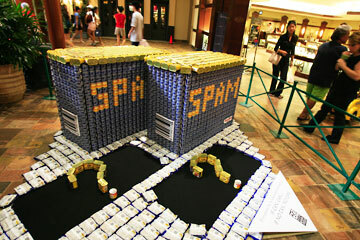 On paper there were six winners at "Canstruction," presented by the American Institute of Architects, Honolulu Chapter. But the real reward for the 17 teams comes in two weeks, when the sculptures come tumbling down and all the cans of tomato sauce, green beans, pineapple and so forth will be turned over to the Hawaii Foodbank, to help 250 agencies serve Hawaii's hungry. Polly Kauahi, director of fund development at the Foodbank, expressed her gratitude: "I had the biggest smile on my face as I walked around the event. The effort that went into feeding Hawaii's communities is amazing. This will be feeding people for months." The teams will hold a "Decanstruction" party and break down their exhibits on Aug. 27. Meadow Gold trucks will pick up the cans the next day and deliver them to Foodbank's warehouse. Kauahi said the Foodbank is most in need of cans of protein, partly because it is the most expensive to purchase. Teams complied, creating towering stacks out of tuna, pork, legumes and sardines. The 17 teams went to great lengths to execute their projects: creating 3-D models, holding pre-building parties and, when the occasional mishap happened, running to the nearest grocery store for new cans. Foodland Super Markets gave teams a discount on canned goods and delivered supplies to Pearlridge Center on Wednesday, but several teams funded some or all of their own projects, or found sponsors. Rebecca Lively, team captain and a senior design architect for Clifford Project, said she and her team of interns sketched out 15 to 20 drawings before settling on "Cansai Sushi." "Lovely Hula Cans: Lighting the Way to End Hunger," won an honorable mention for Richard Matsunaga & Associates. The sculptures will be on display until Aug. 27, then the cans used in the competition will be donated to the Hawaii Foodbank. The sky was the limit for concepts, except that each sculpture could be held together only by Velcro, packaging tape and wire. Projects could be no more than 8 feet tall or wide. Carol Hirai, captain of the Richard Matsunaga & Associates team, arrived before dawn Saturday. In fact, she was the first one there. "I was so excited, I couldn't sleep," said Hirai, team leader of the "Lovely Hula Cans" project. Hirai's team of five builders constructed a hula girl and lamp made up of more than 40 different products, with nori for her silken hair, an asparagus-based flirty skirt and a pork-and-beans torso. "Our hula girl beckons to our ohana," Hirai said. Ukulele players accompanied the builders, and a chanteuse sang -- what else? -- "Lovely Hula Hands." Plus, the sculpture included the five to nine recommended daily servings of fruits and vegetables, Hirai said proudly. The team bought practice cans and held building sessions to refine their techniques. "The practicing paid off," Hirai said. "I want to thank my husband for putting up with my can obsession. I couldn't go past a grocery store for three months without going in it." Kay Kaneshiro -- captain of the KFC Airport team and one of the creators of "Hunger Bugs Me!" -- estimated her firm spent about $2,000, including the cost of a planning party. Her team also held brainstorming meetings every two weeks since it became the first team to sign on last winter. "It's a lot of hard work, but I thought it sounded like a lot of fun and it was a chance to interact with other architects." "Cansai Sushi: Fresh Can of the Day" was created by the firm Clifford Project. THE EVENT was also a way of showing the community that architects build more than buildings, said Amy Blagriff, executive vice president of AIA Honolulu. "We're making this world a better place to live, work and play," Blagriff said. 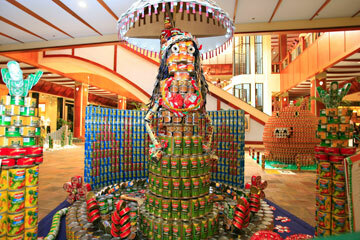 "Canstruction" is a national competition created more than 10 years ago by the Society for Design Administration. Winners from Hawaii's competition will compete at the national level. Events are held annually in such locations as San Diego, Washington, D.C., and Orlando, Fla., and some 80 competitions are in the works this year. Fred Paine, a transplant from Washington, D.C., and a new member of the Pearlridge management team, had observed "Canstruction" events for years in front of George Washington University, where they've been held since 2001 in support of the local food bank. Paine, who offered Pearlridge as the site for the first Hawaii competition, has seen the D.C. area's competition grow, with entries ranging from the "Million Dollar Can March" to a re-creation of the Olympic rings, complete with the cheery slogan "You Can Do This." More than 29,000 people donated cans in the last People's Choice voting. "Every year, I think, How the heck is it going to turn into anything? But every year it amazes me. It's a great way to give back to the community. It was the first thing I wanted to do when I got here." "If Can, Can, If No Can, No Can," took Spam as its inspiration. Dean Baldwin of the KFC Airport team made adjustments to a cockroach antenna crafted from Vienna sausage cans. A slipper was later assembled, crushing the roach, for "Hunger Bugs Me," an ensemble that won the "Best Meal" prize.